We’ve been enjoying sensational blueberries in our part of the world for the past several weeks. We eat them as snacks, mixed into salads, doused in cream—and of course baked into desserts. 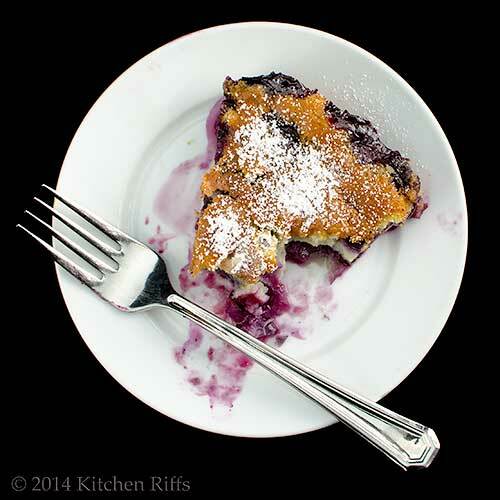 Speaking of which, one of the best desserts we’ve made this year is Blueberry Flaugnarde, a classic French dish. It’s quick and easy to make, and the blueberries just sing with flavor. Blueberry Flaugnarde is also reasonably light, so it won’t weigh you down during these last hot days of summer. And it’s good hot from the oven, chilled from the fridge, or at room temperature. Perfect for a Labor Day cookout, don’t you think? Flaugnarde is really just a fancy name for flan. 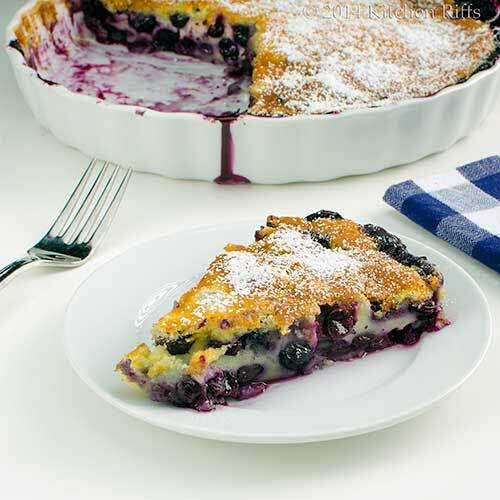 When you make this dish, you simply cover the blueberries with a flavorful custard and bake. You might also see this dessert called a clafoutis—although technically that term is used only when the dish is made with black cherries. This recipe is very similar to the Grape Flaugnarde we posted about a couple of years ago. Easy as that recipe was, this one is even more streamlined. And blueberries are even more delectable than grapes in this dish. We like to serve flaugnarde with just a sprinkling of powdered sugar. But feel free to add whipped cream or ice cream—either adds sensational flavor. Mrs. Kitchen Riffs is the baker in our household, and this is her creation. She adapted it from a recipe in Mastering the Art of French Cooking by Julia Child, Simone Beck, and Louisette Bertholle. This dish requires about 15 minutes of active preparation time, plus about 45 minutes for baking. The recipe yields 6 to 8 servings (depending on how generously you slice the flan). Well-wrapped leftovers keep in the refrigerator for a few days—and they’re great for breakfast! Preheat the oven to 350 degrees F. Butter a pie plate or other baking dish that measures 10 or 11 inches across (see Notes). Wash the blueberries and drain them well. Pour the drained berries into a medium-sized mixing bowl and add the granulated sugar. Toss together until the berries are coated, then set aside. Place the milk (or cream and water mixture) and the eggs in the bowl of a stand mixer (or in a large mixing bowl, if using a hand mixer). Using the whisk attachment, beat the milk and eggs at medium speed until well mixed. Add the lemon extract and salt, then mix them in. Gradually add the flour; once it is becoming incorporated, beat at high speed until the mixture becomes smooth. Pour the berries into the prepared baking dish and spread them out evenly. Pour the batter over the berries and smooth with a spatula. You can serve this dish hot from the oven or allow it to cool to room temperature. Just before serving, sprinkle the flan with a garnish of powdered sugar. This dish works best (and looks prettiest) when baked in an attractive 10- or 11-inch shallow tart dish, especially the porcelain or earthenware types. But you can bake it in an ordinary pie pan, too. Or use individual ramekins or tartlet dishes. In that case, baking time may be a bit less. Eggs carry a slight (but real) risk of salmonella. So we suggest using pasteurized eggs for this recipe. Although it’s unlikely that the eggs you buy will be infected, why take the risk? Especially since it’s impossible to make a dish like this without tasting it. As noted above, when this dish is made with black cherries, it’s called a clafoutis. When made with other fruits, it’s called a flaugnarde (though we often just call it flan). You can make a flaugnarde with just about any fruit—we’ve done grapes and blueberries on the blog, but apples, peaches, pears, and plums also work well. When choosing blueberries for this dish, look for ones that are smooth, with a deep blue (indigo) color. Size has no bearing on quality. You can store fresh blueberries in an airtight container in the refrigerator, where they’ll keep for a few days. Don’t wash the berries before storing them; wash only when you’re ready to use them. You can substitute frozen blueberries for fresh in this recipe. Frozen blueberries are often quite high quality, and generally are a safer bet during the winter months, when “fresh” blueberries picked half a world away have to be flown in. “No doubt about it, this is a berry good dessert,” said Mrs. Kitchen Riffs. “Shall we stop talking a blue streak and have another piece of flan?” I asked. Well, when it comes to this dish, you could say I’m a blue-ribbon eater. I am the flan queen... Caramel flan is one of my faves... I have to try your blueberry goodness!!! Hi Denise, you do indeed make great flan, including the classic caramel! But this is wonderful -- worth trying. Thanks for the comment. Wonderful recipe and your photo, wow! It is temping me to want a slice immediately! I love anything with blueberries...they are so good for you too! I have made something like this only with blackberries. When I lived upstate NY, we picked a lot of blackberries. But I have put your recipe on my to bake list! Thanks for sharing...have a good rest of the week! OH my Goodness!! Just when I was wondering what to do with the big box of blueberries I have on the counter!! Beautifully done. I will call it flan because I don't think I can pronounce "Flaugnarde" without messing it up. :) For sure this is the best looking flan I've every seen. Really looks elegant and inviting. Good post, John. Thank you! Hi Pat, how nice to have your own blueberry bushes! This will be a great ending for some of the harvest. ;-) Thanks for the comment. Hi Dottie, this would be wonderful with blackberries too -- it's one of those recipes that's really adaptable. Thanks for the comment. Hi Ansh, glad to help you out with those blueberries. ;-) Thanks for the comment. Hi MJ, blueberry cobbler is good, but this is better IMO. It really is the best dessert we've had this summer -- and we've had some good ones! Enjoy. ;-) Thanks for the comment. Hi Ray, I always call if flan, too! ;-) But it's great whatever you call it! Thanks for the comment. Oh my goodness. John! Your updates totally are not showing up in my feed for some reason but I am so glad I'm trying to check periodically--this looks AWESOME, and you know how much I love my desserts. A great combo, I'm glad you guys could indulge in the sweet! I consider myself quite the French food connoisseur but ironically have never made a flaugnarde before... definitely missing out on something delicious! This is truly an elegant dessert. Total agree that it is perfect for celebrating occasions including labour day. Hi Ala, sorry I'm not showing up in your feed -- weird. Anyway, this recipe is definitely one you'd like! Thanks for the comment. Hi Thalia, you have missed out! And should remedy that immediately. :D Thanks for the comment. Hi Rocquie, you'll love your breakfast this Saturday! Thanks for the comment. Hi Marcela, it really is delish! Although 5 pieces is a lot! ;-) Thanks for the comment. Hi Zoe, this really is such a great dessert. Good for a special day, or to make an ordinary day special. ;-) Thanks for the comment. Oh, boy, this would be perfect for the weekend! I'm going to savor the last of the summer fruit for the next couple weeks...and baking up a blueberry dessert is part of that plan! Mouthwatering. Nothing like fresh blueberries. 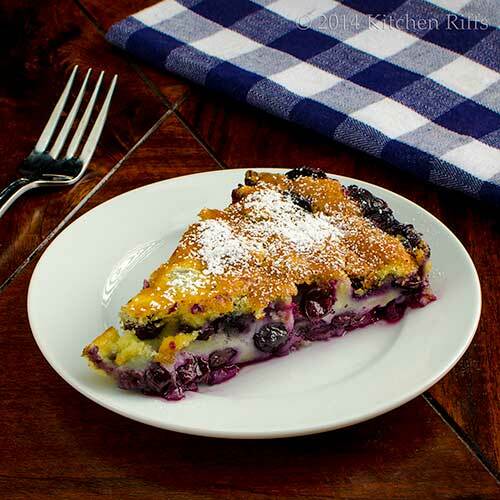 I am like you, I love blueberry buckle, but this might give it a run for its money. I always have an abundance of blueberries in my house - I enjoy them, too :) I have never made flan at home before - would love to try this. Hi Juliana, this really is a great dessert! Terrific flavor. Thanks for the comment. Hi Liz, I think this is a dish you'd really enjoy -- you do such great baking! And this has such great flavor. ;-) Thanks for the comment. Hi Charlie, I always try to use flan instead of flaugnarde just because of that spelling thing. ;-) This is a good one to keep in mind when you have fresh blueberries on hand. Thanks for the comment. Hi Karen, Blueberry Buckle is wonderful, isn't it? But this beats it. Really. Thanks for the comment. Hi Ashley, the neat thing about this dessert is it looks kinda fancy, but is really easy to make. And so tasty! Thanks for the comment. Hi Uru, sorry about that drooling! Makes me drool too! ;-) Thanks for the comment. How berry delicious, John! Love it... like a clafoutis... saving for summer! I have never had FLAN before in my life. I wish I could try it! I am tempted to rush out to your place. Fantastic! Your Flaugnarde looks ever so tempting. I can't wait for blueberry season to try this. Good grief that looks good! My blueberry bushes are done BUT I know where to buy some. Doing this for a Labor Day barbecue. Summer may be on the wane but I'm not letting it go without a fight! Oh wow - I LOVE Flan - but flan with blueberries...I don't think I could resist! I am going to have to disregard the fact that this flan "recipe yields 6 to 8 servings" and grab a spoon and this dish and go somewhere where I don't have to share any of it! Fantastic job Mrs. KR! Thanks so much for sharing Mr. KR!! Hi John, So sorry I've been MIA for a bit. This dessert makes me drool just looking at it. I go through baskets of blueberries each week, I can't seem to get enough of them. In fact I'm surprised my teeth aren't stained blue by now. I love this recipe and it gives me just one more reason to purchase and extra basket of berries when I go to the store. Maybe I'll bump into you and Mrs. KR again. Thanks for sharing this and I hope your summer was a good one. Definitely a berry berry good dessert. I think the picture says it all. You have no idea how many points you get for all the puns. I love the silliness of word plays immensely. Hi Lizzy, it really is berry delicious. ;-) Thanks for the comment. Hi Gigi, you could just look at it! That's almost as good. Well, not really. ;-) Thanks for the comment. Hi Candy, this one is all gone, but we're thinking of making another for the weekend! Thanks for the comment. Hi Rosa, I do so love flaugnardes, and the blueberry is the best we've ever had. Thanks for the comment. HI Maureen, it really is something -- I think you'd love it. Thanks for the comment. Hi Claudia, we're probably going to do another one of these for Labor Day, too. Enjoy! Thanks for the comment. Hi Shashi, this really is a terrific recipe -- and I'd be tempted to eat the entire thing myself, too! Thanks for the comment. Hi Vicki, we're at the grocery store multiple times a week, so chances of bumping into us are good! This is definitely something you should try -- terrific flavor. Thanks for the comment. Hi Carol, word play is a weakness around here. ;-) Thanks for the comment. That is my kind of dessert. It looks pretty AND delicious! Ah, fresh blueberries! Beautiful dessert, a lovely finish to any meal. YUM! This for breakfast? Oh, yes, please! I can't get enough blueberries either. Or peaches. Or nectarines. And I'm still hanging on to the last of the cherries. Love custardy like desserts, this is a wonderful one, especially with the blueberries. Great recipe Mrs. KR! Better than blueberry buckle? I'd have to taste it to believe it. Come to think of it, that's a very good idea. Thanks for this glorious recipe! This breakfast will beat the blues! Breakfast? No doubt about it. It's all about attitude. And this one has a good one. Can't wait until Saturday! Hi Greg, once I started thinking of "blue" puns, I was amazed at how many there were! Thanks for the comment. Hi Pam, pretty AND delicious always works around here! Thanks for the comment. Hi Judy, don't you just love fresh blueberries? One of the best summer fruits. Thanks for the comment. Hi Laura, this is definitely a great breakfast! And isn't it nice we have such a variety of fruit to choose from in the summer? Thanks for the comment. Hi Cheri, Mrs K R really outdid herself with this one! Thanks for the comment. Hi Beth, hard to believe, but it is better. Although you'll probably have to do a taste test just to confirm this. ;-) Thanks for the comment. Hi Abbe, this really is a terrific breakfast. And dessert. And let's not leave out snack! Thanks for the comment. Hi Nee, this really is a terrific recipe -- if you like blueberries, you owe it to yourself to try it. Thanks for the Labor Day greetings, and I hope your family has a terrific one too! And thanks for the comment. And the wild blueberries from Maine have finally started to arrive. They make the best pies don't they? I don't think I've ever made this? Can't remember, but it looks good! Hi Dawn, I agree wild Maine blueberries are wonderful! And this is definitely something you'd like, I think -- worth making. I hope you have a great holiday weekend too, and thanks for the comment. Funny and witty dialogue again! Your flan looks so tempting! Flaugnarde is a new one on me. I'd never heard that term before. It looks a little clafoutis-like? Whatever you call it, it looks irresistible. I like cooked blueberries almost better than fresh because they cook down to be so jammy and intense. Hi Julie, this really is tempting, believe me! It didn't last long. ;-) Thanks for the comment. Hi Carolyn, a flaugnarde and clafoutis are really the same thing -- it's just that "technically" a clafoutis is made with cherries. And you're so right that cooked blueberries have incredibly intense flavor! Thanks for the comment. Woo hoo! This looks even better than a Sara Lee product! I have made Apple Flognarde before and love it... almost a cross between a flan and a clafoutis. 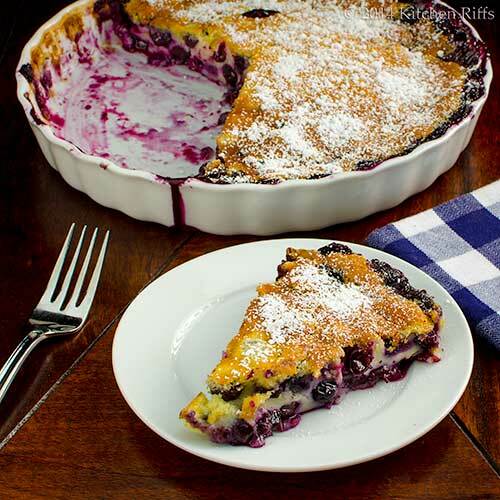 This blueberry flognarde is magnificent and is now on my to-bake list! Hi Fran, lol! Much better! Although some of those Sara Lee thingies aren't bad. ;-) Thanks for the comment. Hi Jamie, we've never done an apple one, and need to. I'm thinking a combo of apple and blueberry might be wonderful. Thanks for the comment. This is a great idea! I love the idea of a flan baked in a pie pan and with added blueberries. Perfect summer dessert! Hi Dedy, this really is delish! Thanks for the comment. Hi Alyssa, this is just wonderful for summer IMO. Who doesn't like blueberries? And dessert? ;-) Thanks for the comment. Such a perfect dessert for any summer fruit, berries or otherwise! Hi Debra, this really is a good recipe with almost any fruit you can think of. We've used a bunch of different fruits in it ad they're all good -- although blueberry works best of all IMO. Thanks for the comment. Such an interesting adaptation, love the creamy texture. I always feel blueberries marry well with any rich cream body, and this custard looks perfect. Great dessert, thanks for sharing. Hi Minnie, isn't this nice? And I agree that blueberries go so well with creamy things. Thanks for the comment. This is one great recipe to try! There's nothing like blueberries!! Hi Pam, this truly is a wonderful recipe! We love it! ;-) Thanks for the comment. Some people really take it very serious with the name giving. Clafoutis only with cherries and any other fruit is just flan. Any who... this is definitely one of my favorite desserts John and you don't make it easier right now with your mouthwatering picture! Hi Helene, it does get confusing between a clafoutis and flaugnarde -- I just call it flan, usually. ;-) And blueberry is wonderful in flan! Thanks for the comment. John, this Blueberry Flaugnarde looks sensational! I'm not familiar with the dish, though I have the cookbook from where the recipe was adapted. Lovely, lovely work. And I love the banter between you and Mrs. KR. Hi Brooks, this is a great dish -- one you should get to know (I think you'd really like it). Great way to use blueberries -- their flavor really shines. Thanks for the comment. Vlueberries are a favourite of the summer. I just put 2 containers in the freezer to savour later, but still plenty to experiment with. This is so mouthwatering! I hope I can find blueberries here soon. Hi Bellini, isn't it fun to have plenty of blueberries to play with? Such a great fruit! Thanks for the comment. Hi Peachy, this dish is good with frozen blueberries, but nothing beats fresh! Thanks for the comment. Hi Louise, glad you have that freezer stash of blueberries so you can make this! We've had an OK crop of local blueberries, but have been receiving outstanding ones from the big blueberry producing states. Imported ones. ;-) Thanks for the comment. Holy moly! This was fantastic! I made it last night and had to keep Bobby from eating the whole thing. I had a second serving this morning for breakfast. My thanks to you both! Hope you're having a wonderful Labor Day weekend! One of the best desserts you've made all year says it all to me. Yummy! Hi MJ, glad you liked it! Although I would have been amazed if you hadn't. :-) This is perfect for breakfast, isn't it? Thanks for letting us know you enjoyed it, and I hope your Labor Day weekend is fun. Hi Karen, this really is a great dessert -- so much flavor. Thanks for the comment. Beautiful dessert. Thanks for sharing John. Hi Lea Ann, this dish really is a beauty -- both in looks and flavor! Thanks for the comment. Elegant indeed :) How I wish I could lay my hands on it right away!! Love at first sight! That looks amazing. Gotta try it this weekend. Is it like a clafoutis? Hi Taruna, I'd like to lay my hands on it right now too -- but it's all gone. ;-) Really worth making. Thanks for the comment. Hi Uru, this is a dish right up your alley! Truly good -- hope you enjoy. Thanks for the comment. Hi Fern, it's a clafoutis. Technically a clafoutis is made with cherries, everything else is a flaugnarde. So I just call it flan, usually. ;-) Thanks for the comment. Honestly I want this for breakfast with a cup of coffee! Hi Raymund, it makes a really great breakfast! I have personal experience. ;-) Thanks for the comment. Yum John, looks amazing! I've never made flaugnarde but you made me want to try it! Hi Chris, it is amazing! Definitely worth trying -- terrific flavor. Thanks for the comment. John, this looks like a wonderful dessert. I love anything with blueberries. Hi Dawn, it really is a nice one! Great way to use blueberries. ;-) Thanks for the comment. Hi Shannon, you really deserve to have this on your table immediately! Terrific recipe. Have fun! Thanks for the comment. This is my kind of recipe - easy and quick! The flavors must be amazing! The pictures speak for themselves. Hi Oana, isn't this nice? And so delish! Really good stuff. Thanks for the comment. I've never eaten nor made a fruit filled flan! That has got to change. This is one impressive dessert! Hi Bam, those blueberry drips are fun, aren't they? ;-) And this is such a fun dish to eat -- your boys would love it! Thanks for the comment. Hi Liz, it does, it does! ;-) Thanks for the comment. I love custard, love blueberries, love flan, absolutely want this flaugnarde... I'm coming over for dessert! Hi Paula, we'll save a piece for you. ;-) Thanks for the comment. Wow! I am speechless. This looks so incredible. Going to try it out for sure! Hi Asmita, it is incredible -- really. ;-) Thanks for the comment. I have to give this recipe a try. It sounds easy and it looks pretty too!!! HI Shibi, so good, we're making it again this weekend! Thanks for the comment. Wow, John! Call it anything you like, but I want some! This looks sensational. And for the record, I'll have mine with whipped cream! Great post! Hi Bill, isn't this a nice dish? Tons of flavor -- we had it again last weekend! Thanks for the comment. !!!!!!! Wow John! This looks phenomenal! I am not sure if I can pronounce "Flaugnarde" correctly (hee hee) but I will remember this dessert for good. I love blueberries and flan... two of my favorite in one dessert. I'd faint by just imagining this flan magically appearing in front of me.. I must make this! Hi Nami, this really is worth making! Truly delish. ;-) Thanks for the comment. Anything and everything with blueberries is always welcomed in my belly. I don't think I've ever eaten a flaugnarde -- thanks for the introduction. The recipe sounds fantastic! Hi Nancy, this really is a recipe worth trying -- easy, and so tasty! Thanks for the comment. Hi Dana, this really is a wonderful dessert -- really the best we've made in quite some time. Thanks for the comment. I love this dessert - blueberries are a special favourite. Thank you, Mrs Kitchen Riffs. Hi Suzanne, aren't blueberries wonderful? And they're spectacular in this dessert! Thanks for the comment. This looks insane!!! I love that the only fat is eggs really... yeah and some milk, but it's good for you. It looks more like dessert to me than breakfast though since there is sugar in it. OMG... this is like French toast, but baked and sweeter. Bookmarking! My friends will go crazy! I love blueberries and this looks so good that I'd be hard pressed to share. Hi Honey, eggs and milk are both great for you! This is such a great dish -- hope you enjoy. Thanks for the comment. Hi Pamela, this is such a great dish -- even though blueberry season is really over, we're thinking about making it anyway this weekend! Thanks for the comment. I can't believe this recipe doesn't have much butter, so I can consider it as healthy except the sugar part? Looks lovely, John! I will take a slice for sure. Hi Holly, you can even cut down the sugar if you want, although it doesn't taste all that sweet as is. Really a great dessert! Thanks for the comment. What a lovely dessert. It really wins for attractiveness, simplicity, and taste. I've never seen this dessert but it will be on my dinner table soon! Hi Mireya, this really is a wonderful dish -- loads of flavor. Thanks for the comment.